Sorry for the delay. I usually post on Mondays but I actually had to write a paper for school about this and I figured since I get a grade for that I should make that a priority. While Neil Postman’s The Disappearance of Childhood is not a ‘current’ book, it was originally published in 1982, with an update in 1994, it is far from being antiquated. Although Postman focuses on media, his arguments can be transferred to digital media as well. Neil Postman’s The Disappearance of Childhood is a bleak narrative about how media erodes childhood. The foundation of Postman’s view of childhood is literacy. Postman contends “the printing press created a new definition of adulthood based on reading competence, and, correspondingly, a new conception of childhood based on reading incompetence.” The printing press causes knowledge to be locked in the printed word and consequently learning to read by going to school is the only way for information to be obtained. As a result of television and also the internet there is no longer a separation of knowledge. Knowledge is accessible by anyone, regardless of reading competence and this along with other factors helps to erode the concept of childhood. I love childhood, I think it that is goes by far too quickly, which is probably why I read a lot of kid stuff. So, at first I was ‘hostile’ at the notion that childhood is disappearing because how can it? Aren’t people having children? But Postman has a compelling argument. Regardless, if you agree or disagree with Postman’s thesis it is a very thought provoking book. The presentation of his argument is done in a very concise manner and while you wouldn’t think it, it was a page-turner. 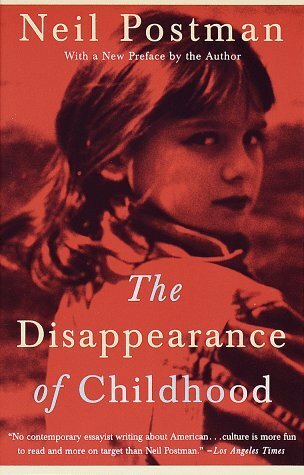 This entry was posted in Adult Nonfiction and tagged Adult Nonfiction, Neil Postman, The Disappearance of Childhood. Bookmark the permalink.